Last year, out of the blue, I was contacted by a young band from Sweden who, through the mystical powers of the internet, stumbled across some of my work on pinterest, etsy or google. They were interested in commissioning artwork for their upcoming EP album and liked my style. You never know what interesting projects people will want when they contact you. Taste in art is so very individual, and we all have different likes. Cover Art??!! That was amazing. One of my teen-age artist dreams was to create incredible album cover art for my favorite bands. I find it perpetually flattering when people enjoy what I create and invite me to take on their art projects! It is always a compliment and an honor to be asked. I do turn down some projects through time constraints, or if I don’t feel I am the right artist for a particular idea, but generally commissions are an unknown mix of exciting, enchanting, exacting and exhausting. For this reason, I’m pretty choosy about where I want to spend my creative time. I was currently in the middle of another big commission project and wasn’t sure I was quite ready for another one. But still….I was very intrigued. And the big question…would I like their music? 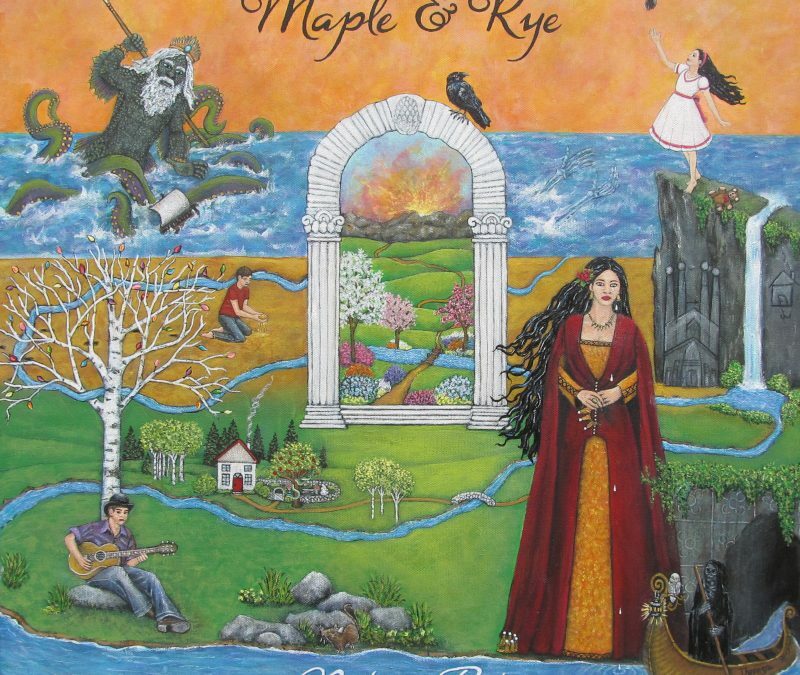 I went online to look up Maple & Rye and see what they were all about. There were a few interesting articles about the band, and a youtube video of their previous single “Lost”. I loved it! The lyrics resonated with me and they had a great sound. These four young men had loads of talent. Leo, Milton, Gustav and Henrik later sent me the lyrics to the new songs that would comprise the upcoming album and eventually we agreed to collaborate. The beautifully written, poetic words painted pictures in my mind. The guys had lots of great suggestions and it was incredibly easy to come up with a multitude of ideas for their cover. Lots of emails and sketches went back and forth. Pinterest boards were created. A plan was made. The cover would be a collage of images brought to mind by lyrics from each of the songs. My biggest challenge was the tight time schedule. The band needed a portion of the painting completed ASAP to accompany the initial release of their new single, “The Hymns of Poseidon”. The rest of the cover would need to be ready a few weeks later. It would be my quickest commission turn around and I wanted it to be as perfect as I could make it. This was a long savored dream about to come true, and though my painting wasn’t coming out on old school vinyl like in my high school days, the idea of my artwork showing up on Spotify secretly thrilled me to pieces. I dove into the particulars and got busy. I breathed, dreamed and lived around that painting for several weeks. I painted on the front porch of my north Idaho log cabin surrounded by birds, deer and quite a few dogs. I neglected my garden. My husband would come home from work each evening to see the progress, and then usually, he’d cook dinner for me. The guys sent me rough cut versions of their new songs, and I was able to spend serious hours painting while listening to and living in their melodies about the Elysian Fields, Catcher in the Rye, and the Spanish Princess. I’ve loved watching this very talented group of musicians skyrocket into their musical careers. Concerts all over the world, videos, new songs, and oodles of adoring fans. It’s been a pleasure to watch them flourish and share a small part of their journey.